When is one Apple worth more than all the stock in Russia? The rapidly approaching festive season is a time for lists, and not just ones for Santa. As the year comes to an end, we enter the season of the publication of lists showing economic performance - which may or may not bring us joy. For instance, last week the stock markets in New York broke all time high records. 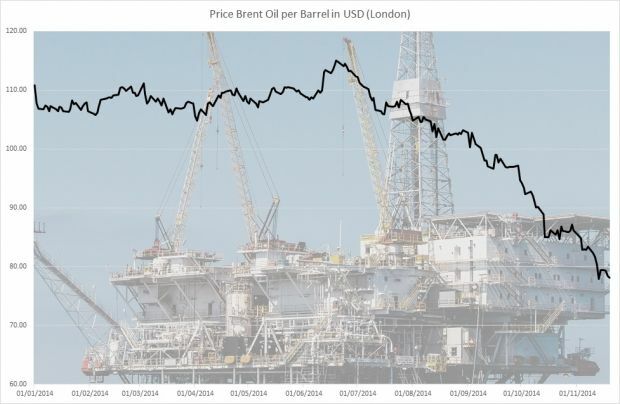 In London the price of Brent Oil on November 13 hit a year’s low of $77.92 per barrel, which is more than 47% less than the maximum price of $115.06 traders were asking for Brent Oil mid-June this year (figure 1). This fall could even translate into a drop in prices at the pumps, but a sharp decrease in the oil price is no joy for those countries who heavily depend on oil exports to fill their budgets. A few of these lists are of particular interest: in sharp contrast with the result so far in New York, the results of the Moscow Stock Exchange RTS have been terrible. 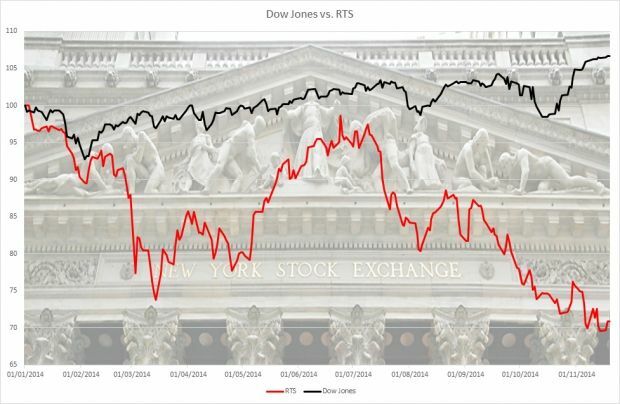 Since the first of January of this year the RTS index has seen a decline of almost 30%, which means that 30% of the market capitalisation of companies listed on the Moscow stock exchange has simple evaporated. In comparison, the value of companies listed on the New York stock exchange has increased by a little bit more than 6% (figure 2). As at the end of every quarter, the UK newspaper the Financial Times recently produced an overview of the value of public limited companies. A Bloomberg analyst made an interesting comparison between the value of the number one on the list, Apple Inc. and the value of the companies listed on the Moscow Stock Exchange. As of the end of the third quarter of 2014, the market capitalisation of Apple has grown to $652 billion. Bloomberg estimated that the total value of Russian equities listed on the Moscow Stock Exchange has dropped to just $531 billion. Bloomberg went on to say that the difference between the value of Apple and the total value of the Russian stock market would be more than enough to buy every Russian an iPhone 6 Plus. Another list published a couple of weeks back, prepared by Bespoke Investment Group, was a ranking of the best and worst performing currencies, compared to the U.S. dollar. Perhaps surprisingly, amongst the best performing currencies are exotic currencies like the Somali Shilling (number one on their list) and the Pakistani Rupee (number two). The Ukrainian hryvnia is also listed at the top of a table, but for an unhappy reason: the table shows the worst performing currencies. 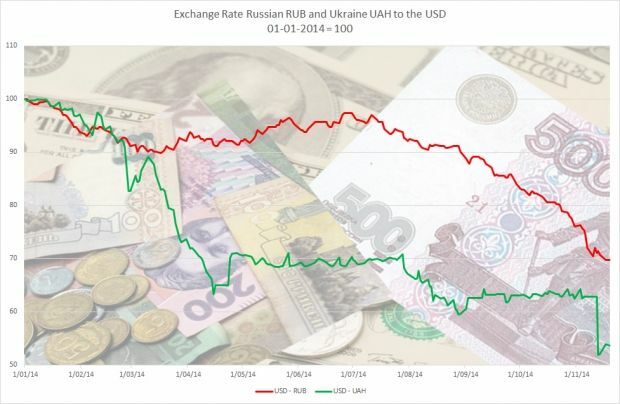 Since the beginning of the year, the hryvnia has lost more than 45% of its value, of which more than 16% was shed in November alone (figure 3). Perhaps comfortingly, depending on your politics, the Russian ruble is right behind the hryvnia, having lost a big chunk of its value in 2014. In fact, since the beginning of this year the Russian currency has lost more almost 30% of its value against the dollar, declining by almost 8% in November alone. The Russian currency is performing even worse than the Argentinian Peso (number four) and Kazakhstan’s Tenge (number six). In the third quarter of 2014, according to figures provided by the Russian Bureau for Statistics, the Russian Economy grew by 0.7%, mainly because of a good harvest. The Russian Central Bank, however, fears that with plummeting oil prices, an estimated capital outflow from Russia to countries abroad of $128 billion and a high inflation rate, the Russian economy will dip into recession during 2015. Despite this, in a recent interview for a German TV Channel, Russian President Vladimir Putin confidently predicted that the Russian economy will grow by 1.2% in 2015, by 2.3% in 2016, and by 3% in 2017.